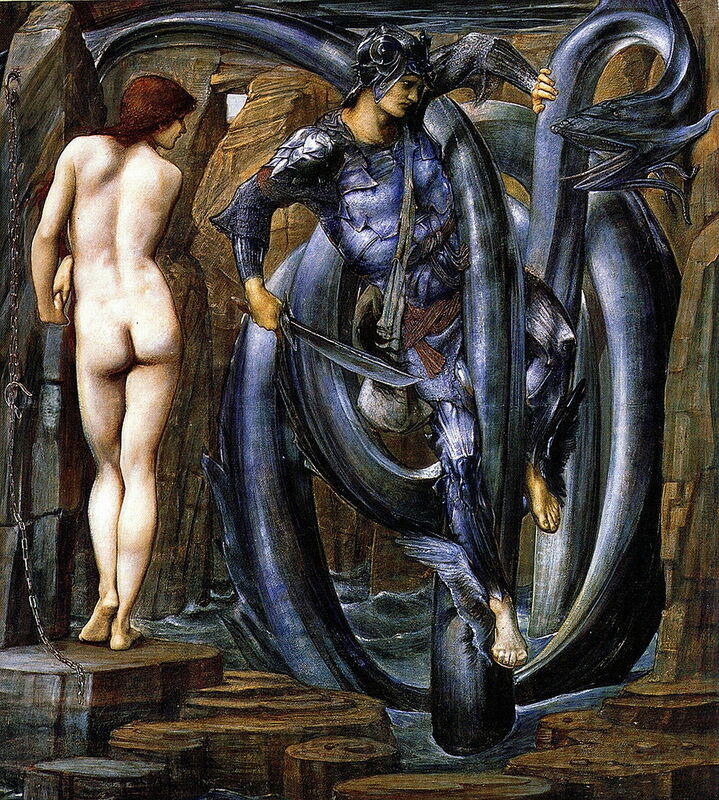 Edward Burne-Jones (1833–1898), The Perseus Series: The Doom Fulfilled (1888), bodycolour, 153.8 × 138.4 cm, Southampton City Art Gallery, Southampton, England. Wikimedia Commons. 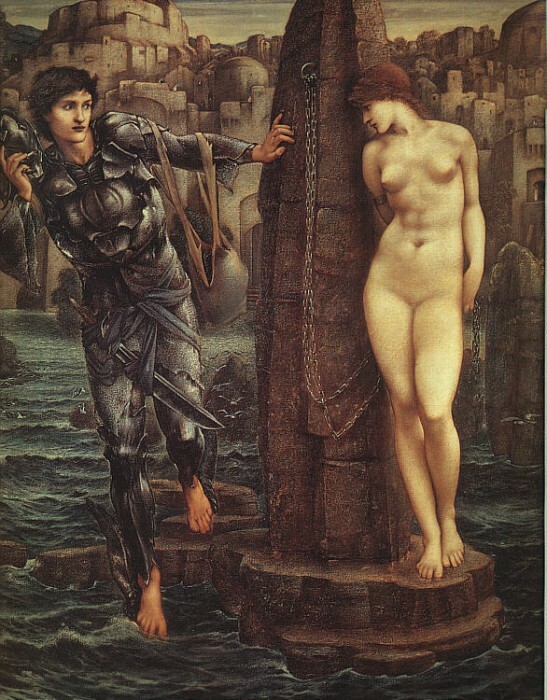 In the previous article, I summarised the story of Perseus and Andromeda, and explained how Edward Burne-Jones came to paint a series of ten works to show that story for Arthur Balfour, a young MP who was to become the British Prime Minister. Here I show the resulting series of paintings. Although he painted several smaller series of four paintings, this was by far the largest and most ambitious project of his career. He tested the concept of using low-relief panels when he exhibited the first, Perseus and the Graiae, at the Grosvenor Gallery, London, in 1878, but it was not well-received. He then appears to have changed the overall design and intended to complete the remaining nine scenes as conventional oil paintings. His general working method was to make various studies for parts of each scene using watercolour, then to assemble those into a full-size study painted using bodycolour (gouache) on paper. That series was eventually completed, and is now exhibited in the Baring Room of the Southampton City Art Gallery, where it gives the best impression as to how the finished series might have looked. His deteriorating health, other commitments and pressures combined to prevent him from completing the final series in oils, but the remaining canvases are now on display in the Staatsgalerie Stuttgart. I do not know what Arthur Balfour placed on the walls of his drawing room instead. Edward Burne-Jones (1833–1898), The Perseus Series: The Call of Perseus (1877), bodycolour, 152.5 × 127 cm, Southampton City Art Gallery, Southampton, England. Wikimedia Commons. 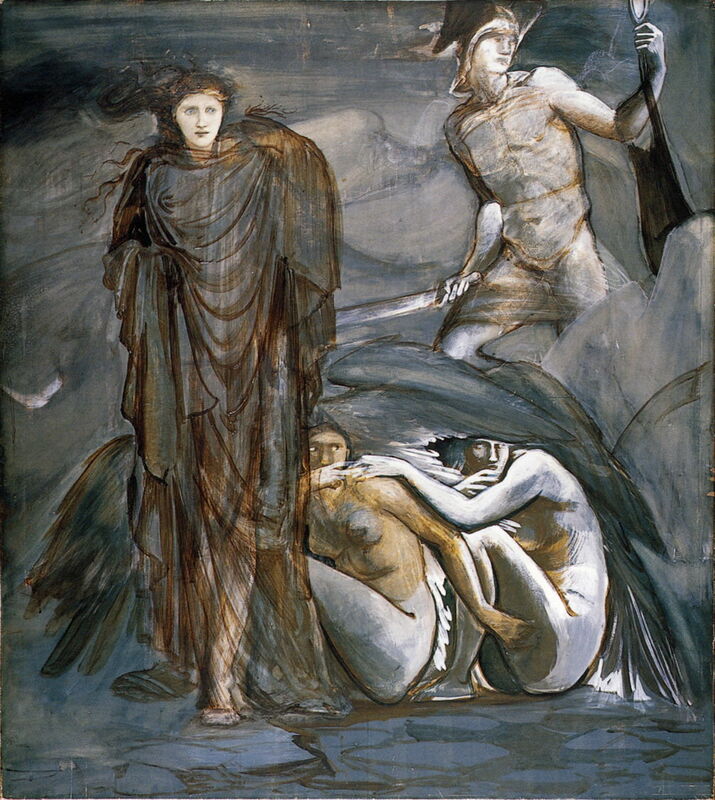 The series starts with The Call of Perseus (1877), which shows a double image of Perseus with Athena outside the city. At the left, Athena approaches the pensive Perseus, who is pondering how he can obtain the head of Medusa, staring into a stream. At the right, Athena has transformed herself into her regular and recognisable form, and is giving Perseus her advice, and providing him with the mirror with which he can view Medusa in safety. 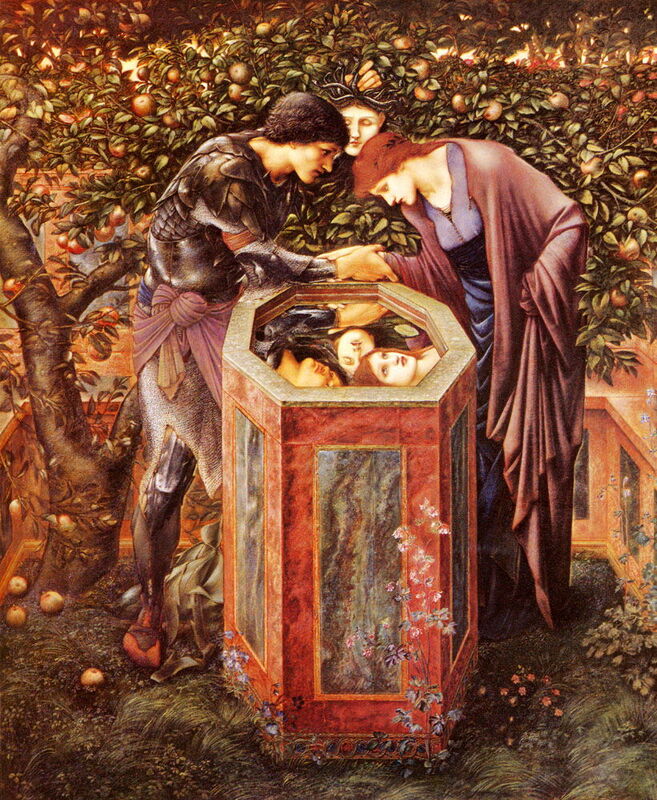 Although other artists have depicted this mirror as an impressive circular shield, throughout this series Burne-Jones shows it as a much smaller circular hand mirror. In the last article I mentioned that this composition is unusual because it includes two scenes involving the same figures in a single composite image, a throwback to practice during the Renaissance which may have been a deliberate pre-Raphaelite device. Others consider it a way of squeezing what is effectively an eleventh image into the series, but the left-hand scene does not appear sufficiently important to the narrative to require that. The Stuttgart oil series contains an unfinished painting derived from this bodycolour study. I showed the second painting, Perseus and the Graiae (1877-80), and its finished low-relief panel, in the previous article for their summary inscription. Edward Burne-Jones (1833–1898), The Perseus Series: Perseus and the Graiae (1877-80), bodycolour, 152.5 × 170.5 cm, Southampton City Art Gallery, Southampton, England. Wikimedia Commons. Edward Burne-Jones (1833–1898), Perseus and the Graiae (1875-8), silver and gold leaf, gesso and oil on oak, 170.2 x 153.2 cm, National Museum of Wales, Cardiff, Wales. Wikimedia Commons. 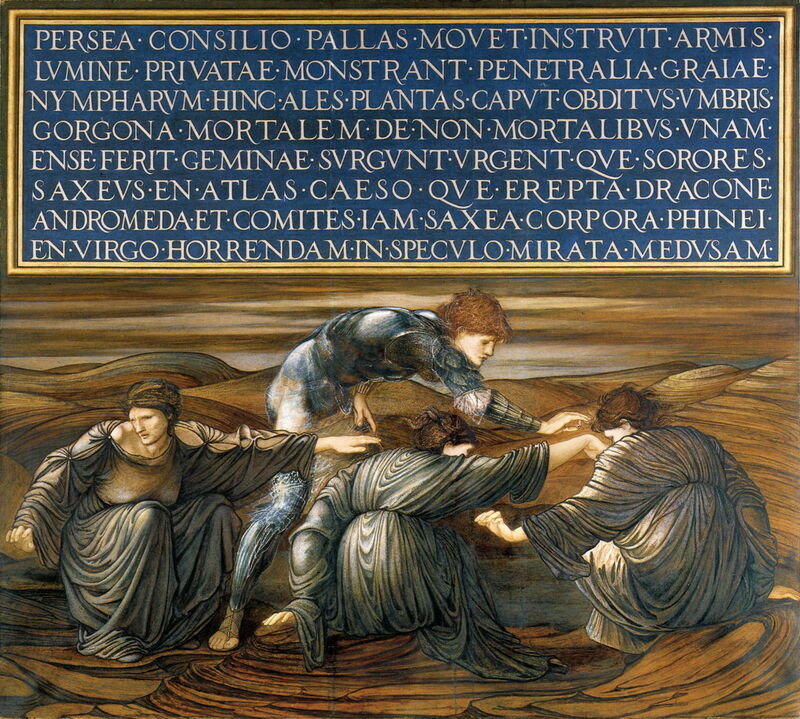 Below that inscription, Burne-Jones shows Perseus with the three Graiae (or Graeae). He has just intercepted and seized their single, shared eye, which he holds in his right hand, in order to force them to take him to the sea nymphs or Hesperides, to obtain the kibisis to contain Medusa’s head. The inscription follows classical conventions in being set in block capitals, using V for the modern letter U, with points separating the words, but no punctuation to mark sentences, etc. As Latin is a highly inflected language, its word order has no effect on meaning, and is much more flexible than English, for example. Working out the grammatical and sentence structure of the inscription is therefore not an easy task even when you do know Latin. 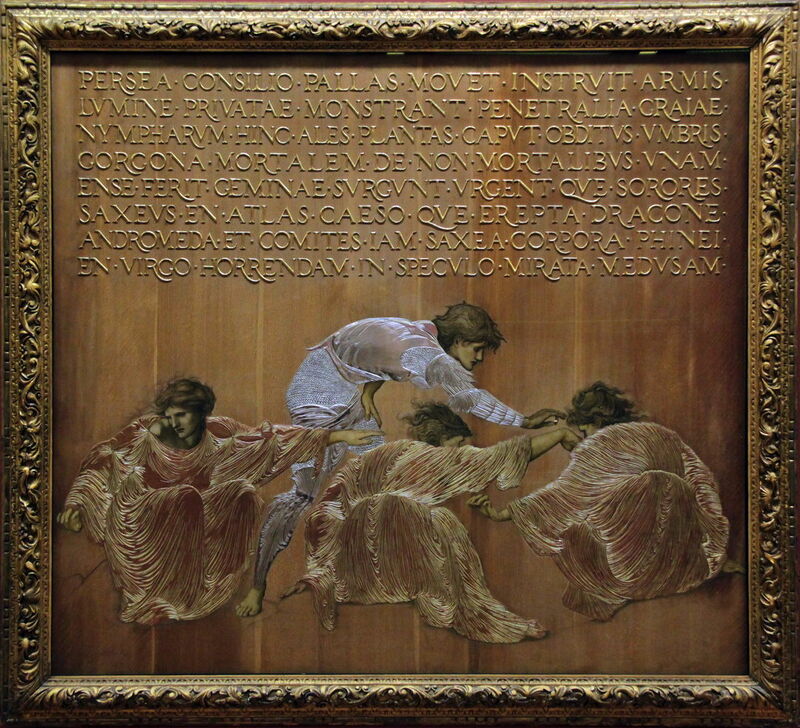 The Stuttgart oil series contains a painting intended to replace the finished low-relief panel, after Burne-Jones changed plan. This dispenses with the inscription, and elaborates on the background in its place. 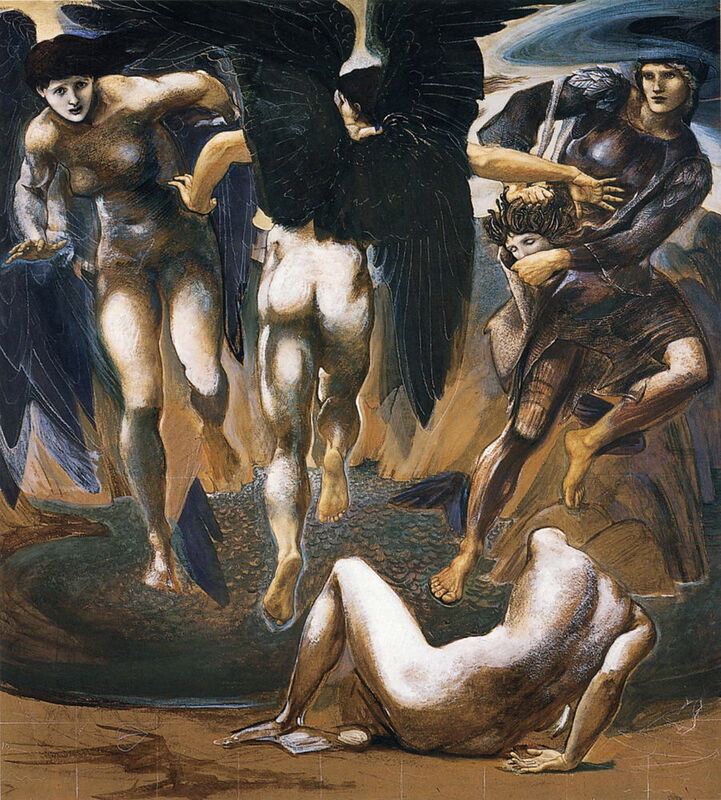 Edward Burne-Jones (1833–1898), The Perseus Series: Perseus and the Sea Nymphs (1877), bodycolour, 152.8 × 126.4 cm, Southampton City Art Gallery, Southampton, England. Wikimedia Commons. The third painting, Perseus and the Sea Nymphs (1877), shows the Hesperides equipping Perseus with the kibisis (at the far right). 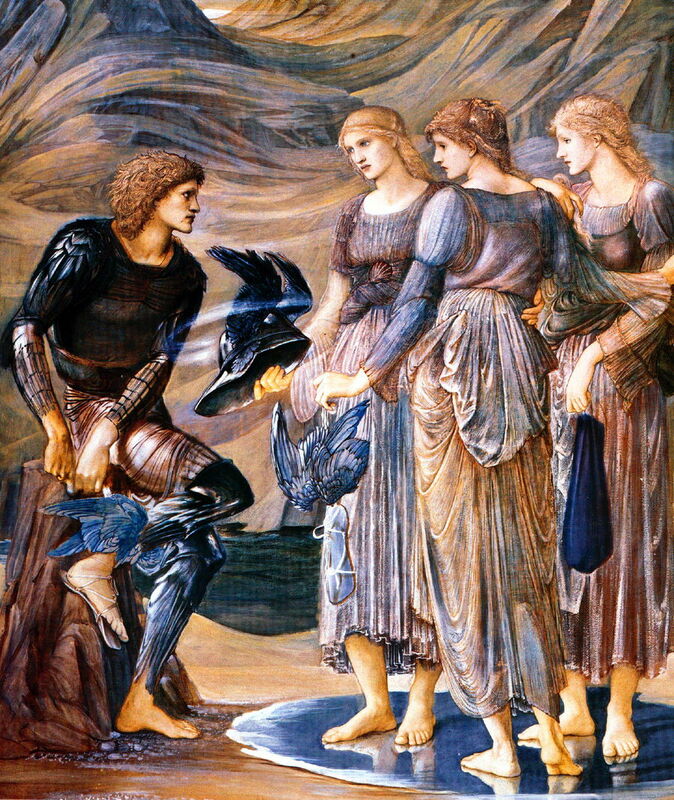 Burne-Jones combines with that his donning the winged sandals (centre) and Hades’ helmet, which were actually provided to him by Hermes and Zeus. He does not show Zeus’ adamantine sword, either. The three nymphs are standing on a miniature representation of the sea. The Stuttgart oil series contains an unfinished painting related to this bodycolour study. Edward Burne-Jones (1833–1898), The Perseus Series: The Finding of Medusa (1882), bodycolour, 152.5 × 137.7 cm, Southampton City Art Gallery, Southampton, England. Wikimedia Commons. The fourth painting, The Finding of Medusa (1882), was left unfinished even in its bodycolour study. It shows Perseus, wearing the helmet of Hades for invisibility, brandishing the adamantine sword, and viewing the scene in his mirror, in the Gorgons’ cave. Medusa, her hair yet to be detailed into snakes, is stood with a fearsome expression, while her two immortal sisters are scrunched together under their wings. 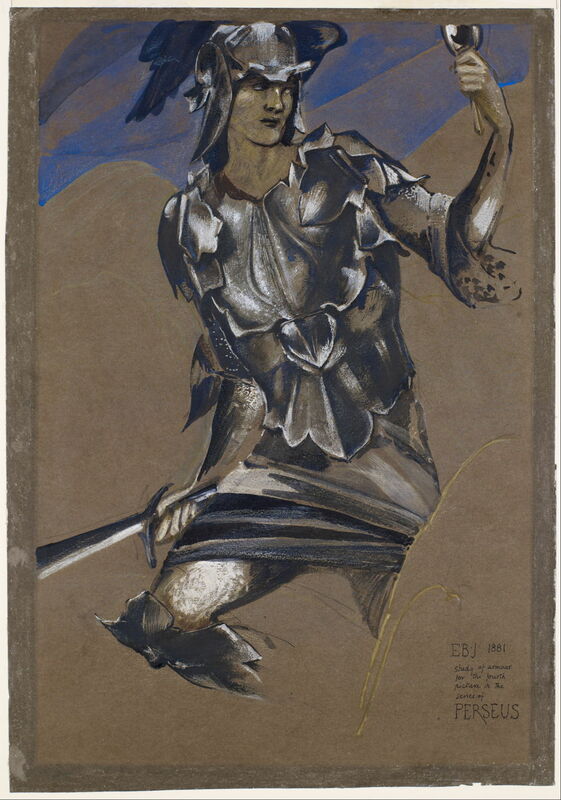 Edward Burne-Jones (1833–1898), The Perseus Series – Study of Perseus in Armour for The Finding of Medusa (1881), watercolour, bodycolour, silver medium and chalk on brown/grey paper, 26.3 x 37.6 cm, Birmingham Museum and Art Gallery, Birmingham, England. Wikimedia Commons. Fortunately there are various smaller studies which have survived, and can lend additional detail: in this case, the watercolour Study of Perseus in Armour for The Finding of Medusa (1881) gives a better idea of how Perseus would have looked, for instance. There is no matching oil painting in the Stuttgart series. Edward Burne-Jones (1833–1898), The Perseus Series: The Death of Medusa I (1882), bodycolour, 124.5 × 116.9 cm, Southampton City Art Gallery, Southampton, England. Wikimedia Commons. In the fifth painting, The Death of Medusa I (1882), Perseus has just cut Medusa’s head off, and holds it aloft with his left hand, at the far right edge of the painting. The adamantine sword is still in his right hand, and the kibisis is slung around his neck. Emerging from the severed neck, as if in collage, are Pegasus and Chrysaor, the latter shown as the associated person and without his characteristic curved golden sword. Three of the serpents from Medusa’s head have detached and fall to the ground. Burne-Jones has here taken to inscribing the names of each figure shown, presumably as this was originally intended to be a low-relief panel in the series. There is no matching oil painting in the Stuttgart series. Edward Burne-Jones (1833–1898), The Perseus Series: The Death of Medusa II (1881-2), bodycolour, 152.5 × 136.5 cm, Southampton City Art Gallery, Southampton, England. Wikimedia Commons. The sixth painting, The Death of Medusa II (1881-2), completes the Medusa story, as Perseus flees from the Gorgons. The headless body of Medusa is left on the ground, and her sisters fly around searching for her assailant. Perseus wears the helmet of Hades to maintain his invisibility, and is flying away with his winged sandals, while inserting Medusa’s head in the kibisis. There is no matching oil painting in the Stuttgart series. 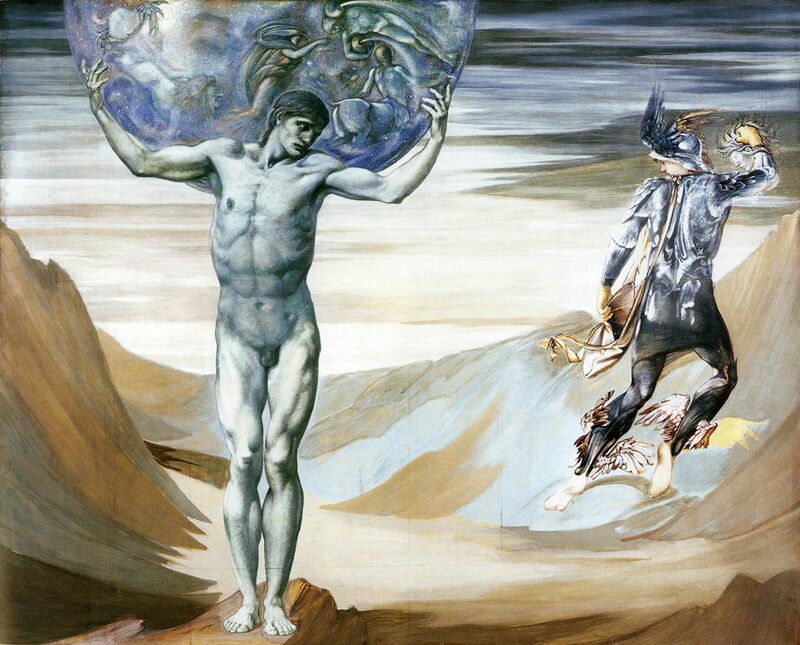 Flying on from the Gorgons to Mauretania, the seventh painting, Atlas Turned to Stone (1878), shows the aftermath of Atlas’ lack of hospitality: he has been turned to stone by the residual power of Medusa’s face, and now stands bearing the cosmos on his shoulders as Perseus flies off to Aethiopia. It is a modern misunderstanding that Atlas, standing in the barren mountains named after him, bears the world, which would be impossible even in Greek myth. He rather bears the heavens, shown here using representations of the named constellations. There is no matching oil painting in the Stuttgart series. Edward Burne-Jones (1833–1898), Perseus and Andromeda (1876), oil on canvas, 152.2 x 229 cm, Art Gallery of South Australia, Adelaide, Australia. Wikimedia Commons. 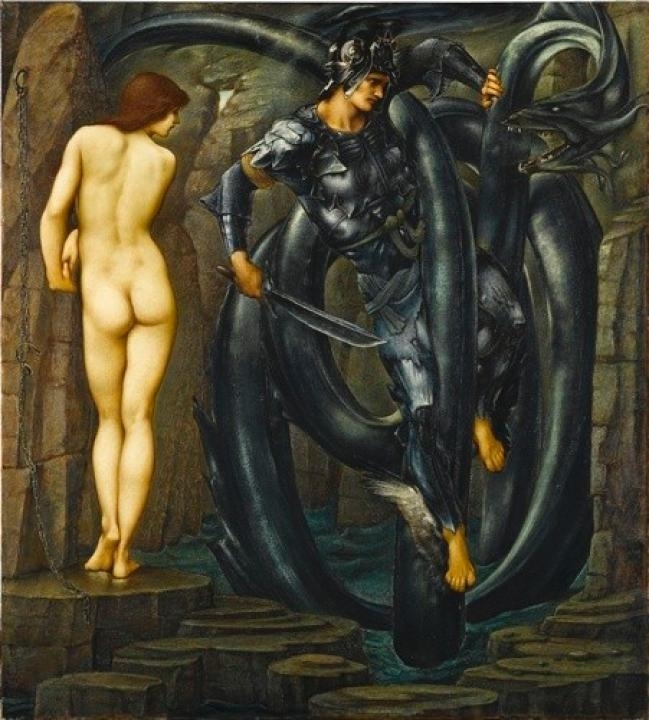 The next two paintings in the series formed the subject for Burne-Jones’ early study in Perseus and Andromeda (1876), a second instance of placing two scenes side-by-side in a single painting. Here there was no intention to squeeze in an extra panel, as both scenes were already destined to be shown as separate paintings. Edward Burne-Jones (1833–1898), The Perseus Series: The Rock of Doom (1884-5), bodycolour, 154 × 128.6 cm, Southampton City Art Gallery, Southampton, England. Wikimedia Commons. The eighth painting, The Rock of Doom (1884-5), takes Perseus on to his discovery of Andromeda, chained to the rock awaiting her fate in the maw of Cetus. His face looks hesitant and uncertain here, and he has removed Hades’ helmet to make himself visible to Andromeda. 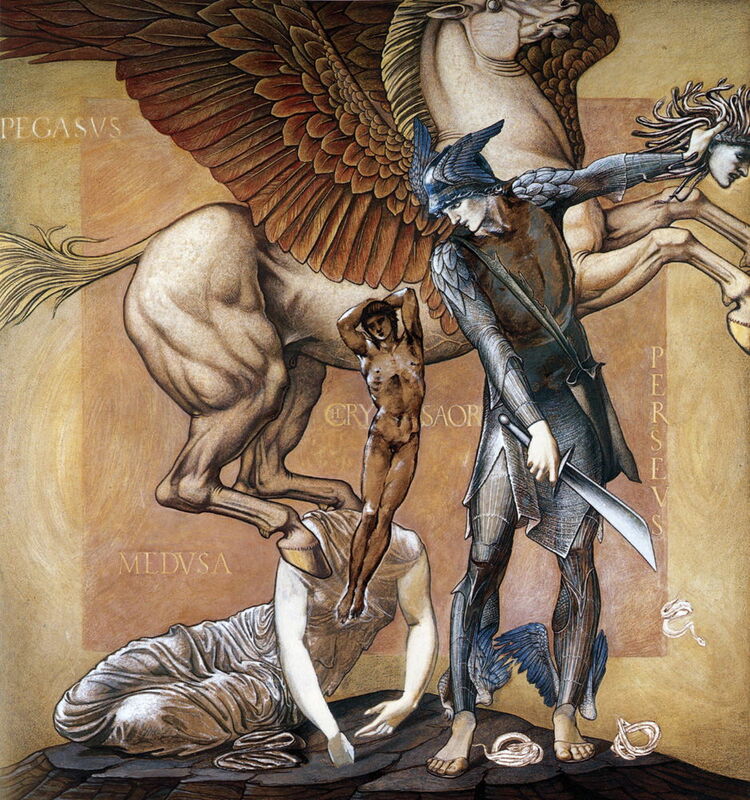 Medusa’s head is safely stowed in the kibisis on his left arm, and Burne-Jones is faithful to the original Greek myth in having Perseus arrive on his winged sandals, not Pegasus. For her part, Andromeda is naked, and looking coy and afraid, her face downcast. She is still chained to the rock, awaiting rescue. In the background, Burne-Jones shows what is presumably the capital of Aethiopia, or he may have accepted Strabo’s attribution to Jaffa. A finished version of this bodycolour study is included in the Stuttgart series. 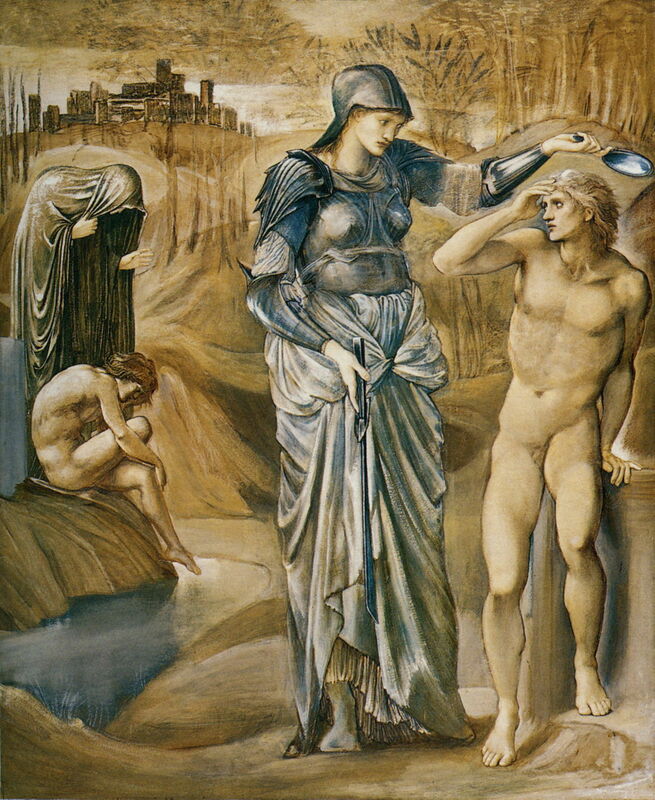 There are some minor discrepancies between the forms of the rocks and chain shown in the ninth painting, The Doom Fulfilled (1888), and those in the previous work in the series, although Burne-Jones maintains continuity in the figures. Keeping Andromeda unchained in situ, Perseus dons the helmet of Hades to become invisible again, and Cetus appears, ready to devour the woman. Perseus is here swathed in Cetus’ coils (whose form resembles an ornate capital letter), brandishing his sword and ready to slaughter the monster and bring its terror to an end. The background view of a city has been obscured by a rock wall, and this small inlet is now enclosed by a low causeway of flat-topped rocks, not unlike those of the Giant’s Causeway in the north of the Irish Sea. A finished version of this bodycolour study is included in the Stuttgart series. Following Perseus’ rescue of Andromeda, they marry; the original narrative resolves through variants which Burne-Jones wisely avoids, but concludes his narrative with a portrait of the couple reflecting back on the story. Edward Burne-Jones (1833–1898), The Perseus Series: The Baleful Head (1885), bodycolour & gouache on paper, 153.7 × 129 cm, Southampton City Art Gallery, Southampton, England. Wikimedia Commons. 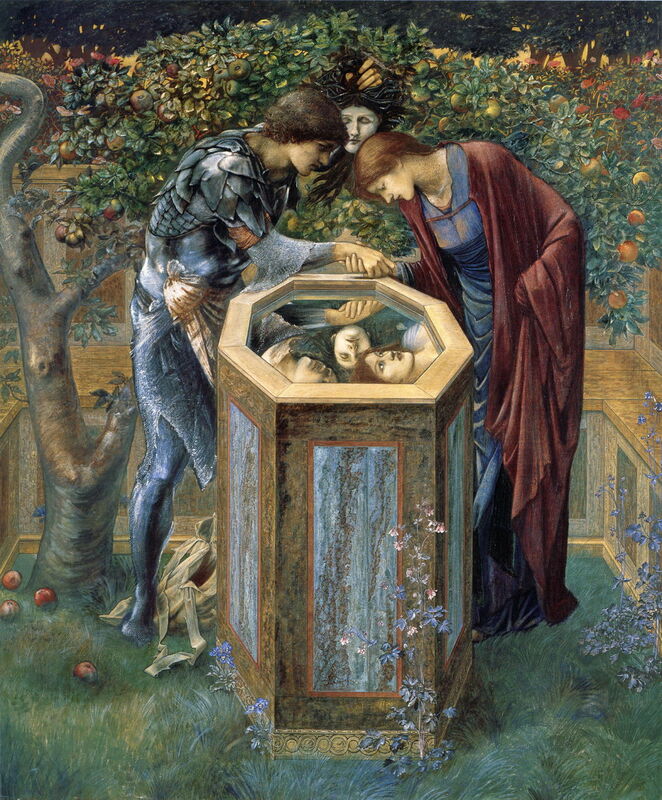 The final painting, The Baleful Head (1885), shows Perseus and Andromeda, their right hands clenching one another’s wrists, looking at the image of Medusa’s face reflected in the surface of a well. This is set in a peaceful garden, with a fruit-laden apple tree behind, and flowers springing up from the grass beneath them. A finished version of this bodycolour study is included in the Stuttgart series. Edward Burne-Jones (1833–1898), The Perseus Series: The Baleful Head (1886-7), oil on canvas, 155 × 130 cm, Staatsgalerie Stuttgart, Stuttgart. Wikimedia Commons. There is a certain awkwardness about the geometric projection of the octagonal well, and the composition has been strained in order to make the reflection appear plausible, but I think that it does remain true to optics – just. The Perseus series was an extremely ambitious project even for a young painter who could dedicate their time to complete it. Thankfully Burne-Jones was able to paint sufficient, particularly in his bodycolour studies, for us to see what it might have been. It is also extremely fortuitous that all its most important paintings have remained in public collections, and not split up among private ones, as so often happens. In general, his approach to narrative is in keeping with traditional principles. As was becoming increasingly common in the nineteenth century, he used facial expression relatively little even when a figure’s face was displayed quite clearly. However he augments body language with strong cues and clues to the original narrative. This leaves no doubt as to what is shown in each painting, and how each fits into the overall story. 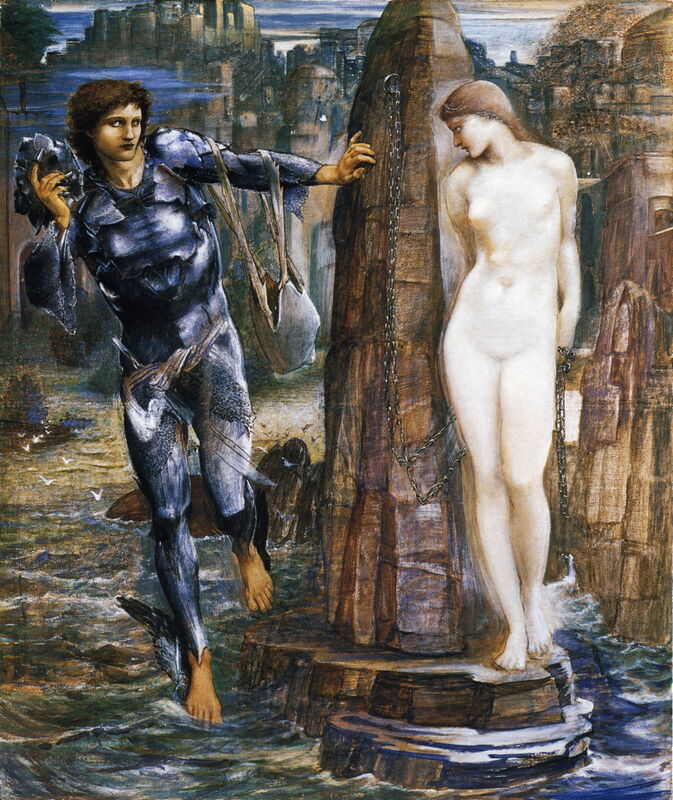 The one anachronous technique which he uses is that of combining multiple images into a single painting, something he did in one study, Perseus and Andromeda (1876), and again in the first painting in the finished series, The Call of Perseus (1877). I would love to know whether this was an intentional technique as part of a pre-Raphaelite aim – which it appears to be. It is certainly unusual if not unique among European narrative paintings of the latter half of the 1800s. The Perseus myth contains several moments of peripeteia – the original challenge to bring Medusa’s head to Polydectes, Medusa’s decapitation, Andromeda’s rescue – which are explicitly included in the series. Although references to the future changed fortunes are perhaps not as clearly shown as they might have been, the series technique compensates for that. As a result, the whole series appears eloquent, moving, dramatic, and powerful as narrative. What this series leaves completely unresolved is the original quest for Medusa’s head, and Perseus’ discord with Polydectes. When Perseus returns to find the king, he is in the midst of another banquet. Just as Polydectes’ banquet had started this story, so it finishes it: Perseus announces his gift to the revellers present, and is mocked. He therefore flourishes Medusa’s head from kibisis, turning Polydectes and his guests to stone, which can still be seen on the island of Seriphos (now Serifos, in the Aegean Sea). It seems a very strange telling of a story which omits such a dramatic conclusion. Anderson A & Cassin M (1998) The Perseus Series, Sir Edward Coley Burne-Jones, Southampton City Art Gallery. ISBN 978 0 9017 2318 5. The Baring Room of the Southampton City Art Gallery is well worth a visit, to see the most complete version of the Perseus series. 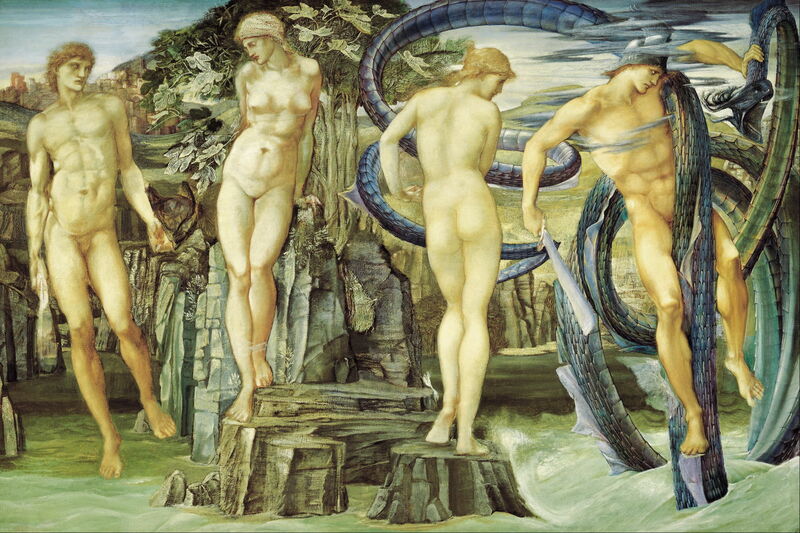 Posted in General, Painting and tagged Andromeda, Burne-Jones, narrative, painting, Perseus. Bookmark the permalink. Wow ! This is fantastic. I have long loved these paintings, and you have done a wonderful thing in putting all the versions together, with such an excellent narrative. Do you know Burne-Jones’ sketch designs, in Tate Britain’s collection, suggesting how they might have fitted together in Balfour’s Music Room, with foliage panel surrounds ? Anyway, thanks so much. Burne-Jones was a genius. Will look at other things on your website. Steven B.
I have seen the Southampton paintings which are fairly local to me but none in the Tate yet. Thanks for this – I grew up in Southampton and had the opportunity to gaze at these paintings many times. I’ve always loved them. The Staatsgalerie in Stuttgart is my little refuge (I live nearby) and I so love these paintings. It truly is a blessing that they are on public display, in one room, together. Burne-Jones really was a master narrator! Thank you for your detailed descriptions of the studies and the paintings which are not included in the Stuttgart cycle!! Thank you – you are very fortunate to have such a fine collection close by. If you ever get a chance to visit Southampton, the City Art Gallery there has the paintings that you should see. It’s a small but rather good collection.